The Vale Earth Fair are hosting a Record and CD Fair to raise funds for the Vale Earth Fair. It takes place at the Second Guernsey Scout Group HQ - The Wayfarer Centre, Rue de Haut, Vale (Perry’s ref. 9E4), with live music, food and refreshments also on offer. All musical tastes are catered for, from pop to classical, rock to techno, jazz to drum n bass. As well as the numerous bargains to be had, there will also be plenty of collectibles on offer. The fair takes place on Sunday 3 June and runs from 10am - 4pm. “We have a number of stall holders booked for the event already, including one from Jersey”, said Rob Roussel, who is organising the event, “but there is still space for others”. If you have your own records or CDs that you would like to sell, please contact Rob on 07781 107698 or email info@valeearthfair.org . Sellers are charged £10 per table plus £5 per additional table if you need more than one. There will be a £2 admission charge for buyers. 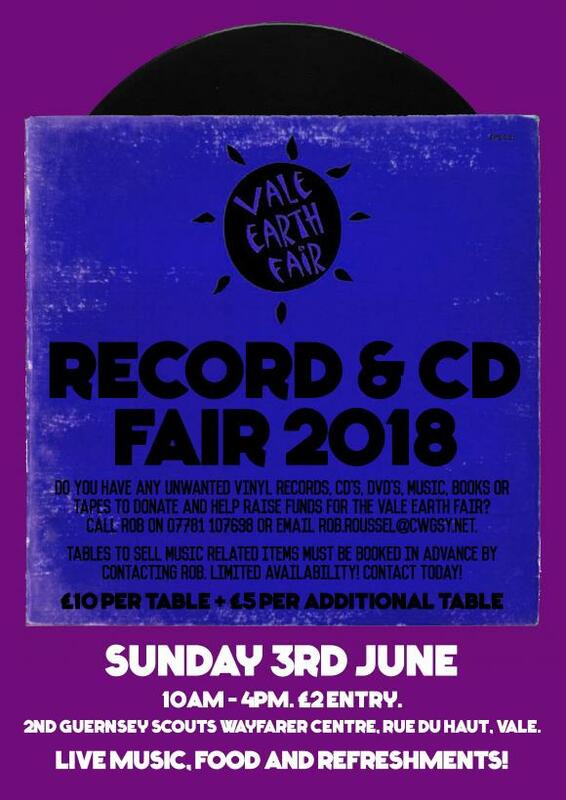 The Vale Earth Fair Collective is also appealing for records, CDs and other music related items to sell at the fair, so any donations to help raise money towards the Vale Earth Fair would be welcome. Please contact Rob Roussel if you have anything music related to donate and he will arrange collection if required.